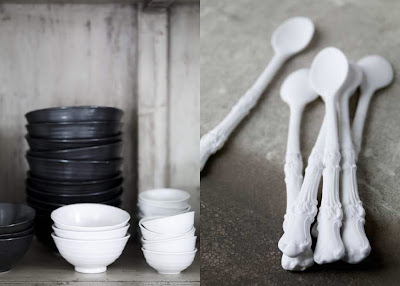 A sprinkle of monochromatic tableware is just what my Tuesday desires. On the left, stacked ceramic charm from Tine K Home. On the right, bone china spoons with capricious curves from Caroline Swift. My table is begging to be amused with these lovelies.